Ludo Mich is a Belgian Fluxus artist, performer and filmmaker, active since the 1960s. Ultra Eczema helmer Dennis Tyfus was instrumental in bringing Ludo to the attention of a younger generation after he saw Ludo’s pansexual aktionist emetic films from the 60s and 70s – nudist adaptations of science fiction and Greek myths. 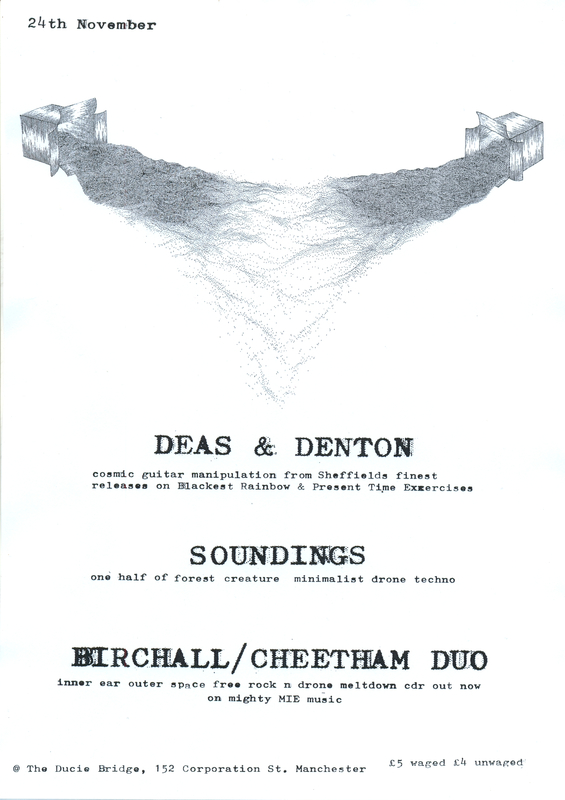 In 2005 Ultra Eczema released an lp cut from the soundtracks of these experimental films which featured Da……daist poetry, savage cries and screams, homemade instruments and junk sound. Through this fresh wave of exposure, recent years have seen Ludo Mich collaborating with, amongst others, Dylan Nyoukis, Kommissar Hjuler und Mama Baer and Wolf Eyes. Harappian Night Recordings is the solo moniker of Hunter Gracchus member Syed Kamran Ali. Since releasing his critically acclaimed debut album, The Glorious Gongs Of Hainuwele, on Bo Weavil early in 2009 (voted 11th in The Wire magazine’s end of year poll) Ali has produced a slew of increasingly deranged albums on various microlabels across Europe. These releases have seen him move far beyond ‘musical forgeries from an imagined east’ into ambivalent and disturbed psychic territories that have parodied, mutated and ripped apart singular fourth world cosmopolitanisms in a disjunctured maelstrom of frenetic, conflicting and distorted energies. This will be Ali’s debut performance as Harappian Night Recordings in the UK. Pascal Nichols is one half of improvising duo Part Wild Horses Mane on Both Sides, who were recently justly described by a conspicuous music critic as the best live band active in the UK right now. Although, as a percussionist, Nichols has collaborated with a number of free improv luminaries it would be wrong to judge him by the criteria of earlier generations. Although technically proficient, the really intriguing qualities of Nichols lie in his insatiable interest in sound and his endless and authentic pursuit of the elusive wild mercury of genuinely collaborative improvisation, undistracted by the idiomatic flippancies and rodomontade of much free improv. 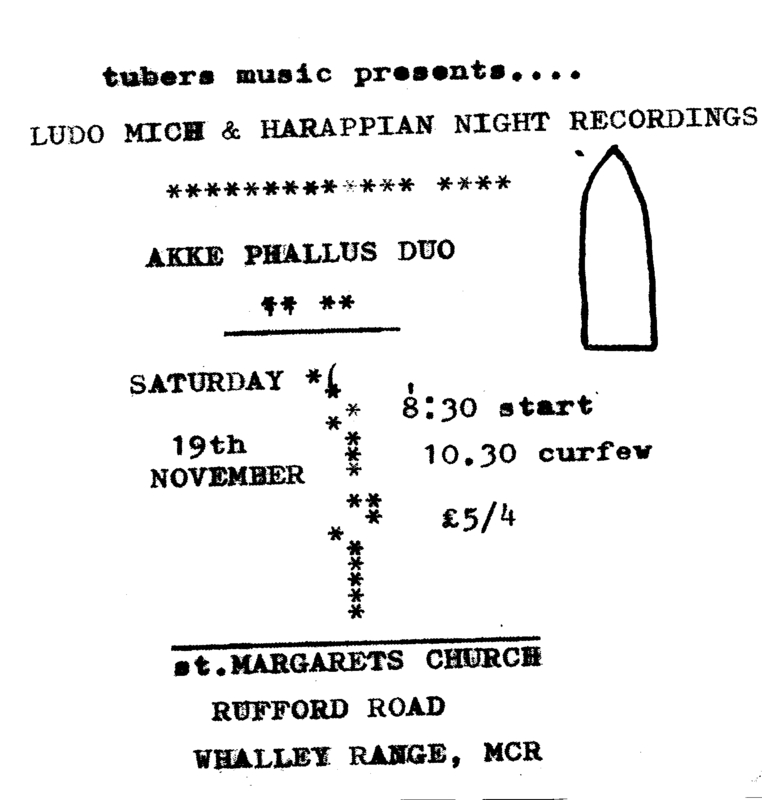 + Akke Phallus Duo: A long overdue and much anticipated collaboration between Ben Morris of Chora and Jon Marshall of The Hunter Gracchus. Postally sharing raw voice, poached acousmatic sound & brut instrumental ingredients, shitting on Eno’s Fourth World confluence of privilege, they navigate modes of avant-experimentation open to the freedom & potential of this new duo dynamic. Wheezing & stuttering non-musics through broken mics and burst bellowed reeds, they integrate the spectres of position, loss, resistance and the fruits of free-hybridity from the comfort and confusions of the First World. cosmic guitar manipulation from two of Sheffield’s finest plus visual accompaniment. LP out now on Present Time Exercises.